When I was walking off from the last yard sale this morning I saw a box with a bunch of crayons, pens, colored pencils, for a whole 50 cents. I immediately thought of Lilly and handed over my quarters. Last time she visited I got out a could of the large sizes non-toxic water based markers and set her up to the workbench to show her how to scribble. She got in a couple great scribbles, but when I looked away, she bit off the end and turned her mouth a beautiful shade of cobalt blue, making magic markers out for awhile. She's coming to visit us tomorrow and thought I might try crayons with her; something big and chunky that she could easily hold. Select your colors. They can be anything; combinations of the same color, all different colors mixed together; whatever you want. Remove the papers. 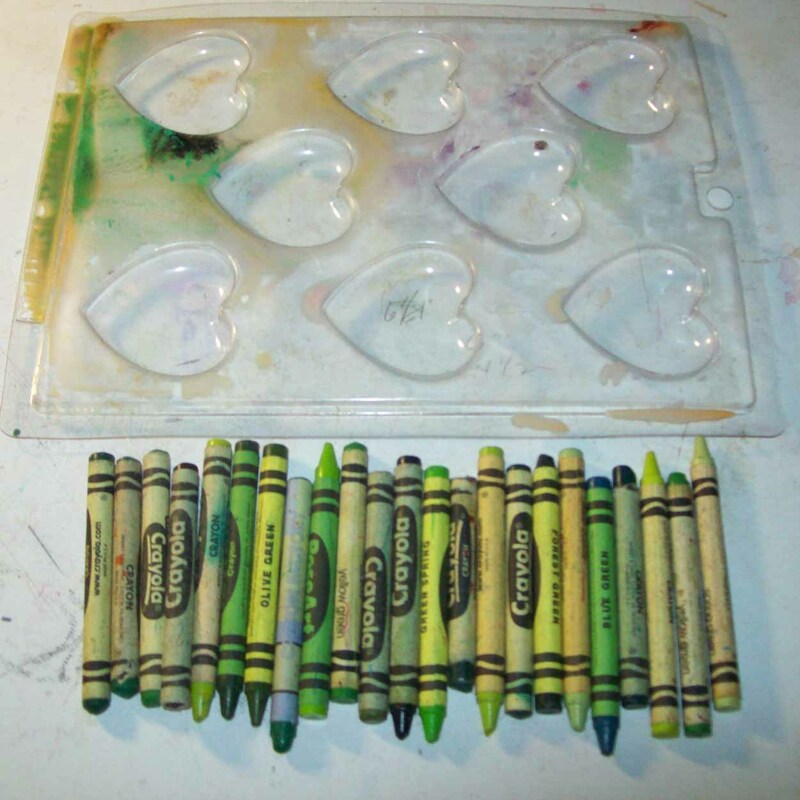 Put the crayon pieces into a plastic mold. This is a heart shaped candy mold. Just make your best guess as to how many you need. Microwave on low (I used power setting 4) for about 7 minutes, or until the crayons are all melted. (I don't recommend the high power setting; you might melt your mold). 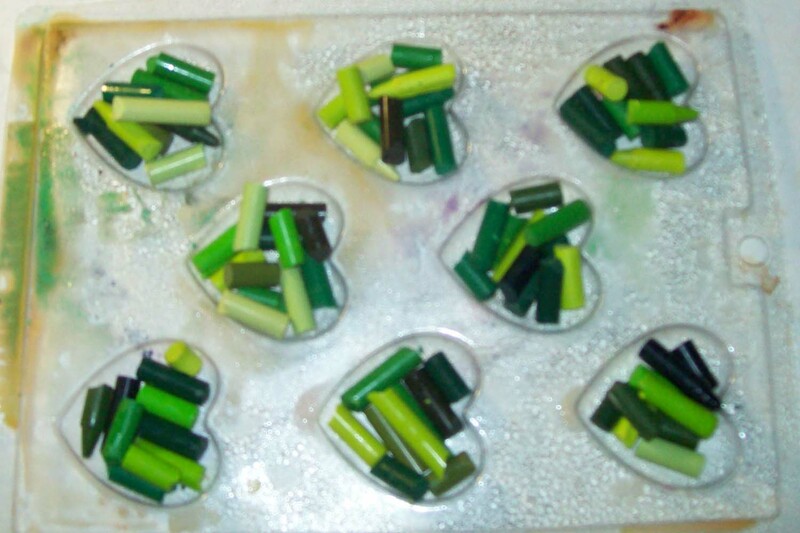 Leave them in the microwave to cool (about 30 minutes); the wax is very hot and, almost as bad as burns, can make a tremendous mess. 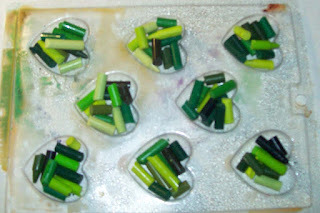 When completely cooled, turn your mold upside down and pop them out (Just like using the old ice cube trays). I learned a couple relatively non important things during this process. Peeling the paper off can be a real pain. There were three different brands of crayons in the box and each brand uses a different amount of glue in attaching the crayons. 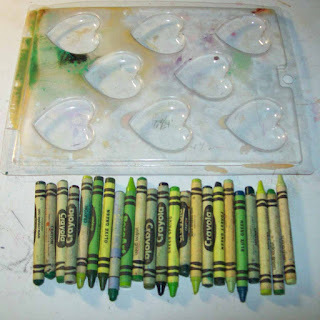 The crayola brand were the easiest to remove; the paper is not glue directly to the crayon and the RoseArt were the most difficult; the end of the paper is actually glue to the crayon. There were a number of washable crayons. I dropped all the crayons into a tub of water figuring that would loosen the papers quickly. The washable crayons started to dissolve in the water, creating a real mess. I now find myself wondering about the possible art, texture uses for these washable crayons. Perhaps let them soak until the start to dissolve, then smear them across fabrics or papers .... hummm. I see some experiments in my future. 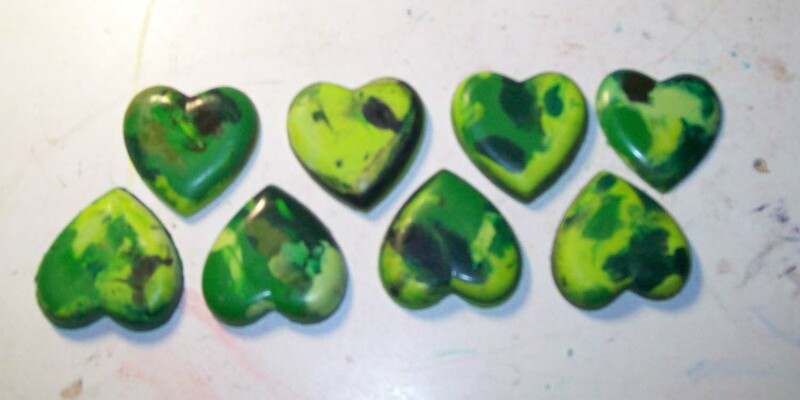 I'll make up a few more batches tomorrow, in a variety of colors, and see if Lilly is ready to play with holding crayons and scribbling on paper. If not, and she just eats them, at least they are not toxic. Those are really cool. Very clever idea!